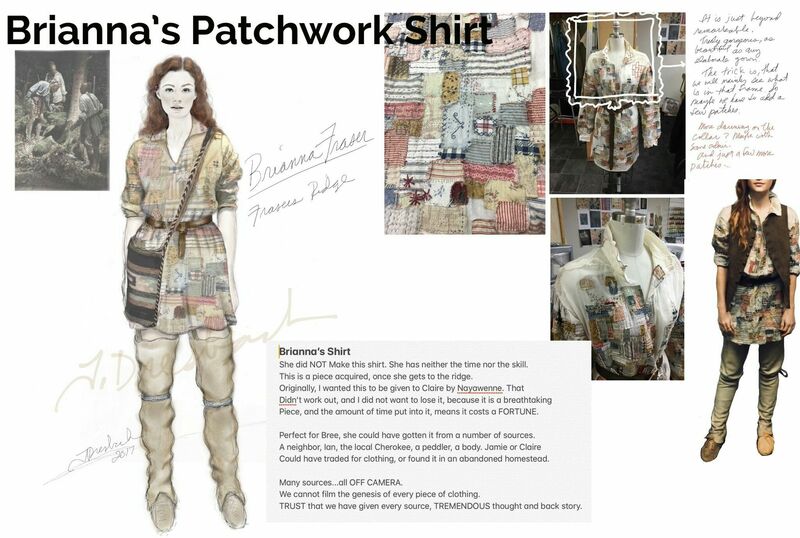 So in the discussion on my Facebook Profile about the last blog about Why Sew?, there was a mention of another outfit I’ve been oodling over…Brianna Randall Fraser’s Patchwork Shirt. So who in the world is Brianna Randall? As some of you may know I’m a huge Outlander fan and she’s one of the characters in that series of books that are being made into a TV Series on Starz, which is excellent if you haven’t seen it. The clothes/costumes are as important, intricate, beautiful as the Game of Thrones costumes, but haven’t received as much publicity. The story is about a couple that meets, fall in love, yadda, yadda, yadda, and they have a daughter, and one of the daughter’s costumes is this incredible shirt. This isn’t the first time I’ve been inspired by this show. And then the plethora of plaids finally got to me so that….. But the show designer keeps coming up with the fantastical fabulous designs, that are really interesting. And they are all inspiring! But the current costume really haunting me is Brianna Randall’s patchwork blouse. Now, this would fit beautifully into my lifestyle! And the handwork on this is extraordinary. Amazingly when the outfit first appears, it’s really low-key and you can easily miss it. I love this sort of handwork cause it’s not the normal showy stuff you see, but it’s obvious that it’s hand done and it’s equally obvious that it was. This is the debut of the shirt. Here’s a better shot and you can clearly see the detail in the shirt. And here’s a real up-close view of exactly how much handwork is involved in this garment. Some of the work is on the patches and some isn’t. And this is how it starts….deciding what patches to use, and herein you see immediately the problem….how to match colors, patterns and make it all work. How much to distress, how much to leave new-ish? How to make it look authentic? How to make it look interesting? There are so many options, it’s overwhelming, but this is exactly what artists do. Click here where she describes how really remarkable the shirt is. They had to make 3 or 4 of them for the show. That’s normal for theater, movies, and TV shows because of the actors’ activity or the prospect of their activity ruining or in some way damaging the garment so that it doesn’t fit into the story – Say they spill mud or stain on it while walking across a room. In the story that didn’t happen so a stain appearing suddenly on the garment doesn’t fit into the storyline. But back to the garment. Here’s why this is so incredible…. Red Arrow – the little hand embroidery dodads that aren’t even on any patchwork but spread out throughout the blouse. OK – so you get it – it’s all done by hand. Now if this were to sell at retail (which wouldn’t happen cause they couldn’t replicate this and meet their price points – but go with me here on this), it would probably retail around $800 – $1200. So this is a unique, one-of-a-kind item, an artistic piece – a lot like Alamaba Chanin’s type of work, then you get a very fair estimate of the value and worth of the garment. This is a lovely sleeveless shirt with the same sort of intensive handwork that is involved in the Patchwork shirt, only it’s not as much work as the patchwork shirt. Click on the photo for more info, but this retails for $738 – a sleeveless short top. Another cute top with more handwork retails for $798 – click the photo for more info. This is about as close as I can find on the net, and comparable items are priced around $1,900 – because they are hand embroidered, assembled or partially assembled. This gives you the idea about the value of the Brianna shirt. And it also gives you an idea about some other things. The plain-and-simple value of anything you make that is unique and individualized. The point is that if you were to make this shirt, the value would be there – it would be in the thousand-dollar mark. What types of fabric to use – heavy/light?….how heavy?….how light? What colors of fabrics to use? What print patterns of fabrics to use? What embroidery stitches to use? What style of design and methods of attaching pieces to the shirt to use? And of course the best of all – where to put the pieces? Believe it or not, a lot of that has been solved by the designer of this shirt. At the same time, I don’t like and would never recommend copying the shirt out right. That’s boring. The whole idea of the shirt is to take the inspiration from the shirt and using some of the techniques, some of the placement ideas, some of the color ideas, some of the fabric ideas, and some of the style ideas, an artist can do her/his own shirt that is her/his interpretation of this design. A copier would take this shirt and duplicate it exactly, an artist would take this shirt and be inspired to do her/his own shirt and have a unique, one-of-a-kind, very expensive-looking take on this garment, and without putting your eyes out with all the glittery bling on it. As a matter of fact, it would look like the remnants of an antique shirt that was upcycled. This shirt hits all my buttons – not showy but it is showy, not tailored but it is tailored (made from a shirt that can be tailored, fitted and shaped to any size and style), doesn’t look expensive until you really look at it and then you realize just how intricate and detailed the work is. It also screams durable, one of my main operative words, whether it’s something that lasts for decades or it’s something that can or has been repurposed. It looks as if it has it’s own a story to tell! Thanks Bev – this was a lot of fun to write!